The 2018 Kia Soul wagon's styling remains fresh and funky, and its interior offers room for five, or two people and a ton of cargo. Kia knows its intending audience is a young one, so Apple CarPlay and Android Auto are along for the ride, as are the UVO3 infotainment system, autonomous emergency braking and adaptive cruise control. Family car - accessible, comfortable, and smooth action! Hard to replace transmission - took over 6 months to get the replacement to work correctly. Comfortable seats with adjustable headrests. Excellent heating and air conditioning. Heated seats and dual heating and air conditioning controls in the front seat. Separate heating and air conditioning controls in the middle and rear seats. Plenty of room in the cargo area - deep and available areas to hang grocery bag handles. Has great "pick up" on interstate. Easy to handle no matter the condition of roadways. Great vehicle for trips or for around town. Gas mileage is reasonable in town - better on interstate. Audio speakers are well balanced. Side rear doors open flat and can be opened with key fob - wonderful when have an arm load of cargo. Kia souls may be plenty but they are not good! The car is way too small in the trunk. I can't even put a suitcase or diaper bag in there since there is no depth. When you take off, the car sounds like you are breaking the sound barrier but you are only going 30 mph and it takes forever to get up to speed. I say a few "hail mary's" if I accidentally pull out in front of someone because you may get ran over. There is no cd player so you are almost coerced into paying for sirius. It should get better gas mileage for something that is basically the size of a go cart. I hate the car but can't trade it in because 6 months after buying it new it is half the value of a new car.I give it 2 instead of 1 stars because it does have good head room for the driver and a good warranty. Kia Soul is sporty but practical a balance that fits different lifestyles. First of all I really like the gas mileage. 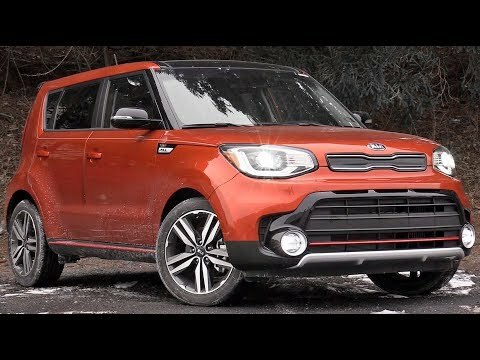 The Kia Soul really handles nicely with good power when entering and exiting the highway. I like the "sport" drive mode, which gives you the feel of a sports car and hugs the road and curves. The seats fold down in the back so that you can haul equipment etc. . . I wasn't sure at first about the room but both my children are 5'9 - 6'2 and ride in the back. They do not have any problems with leg room. The only thing I would change is do not sell it as an SUV. I do not like the pressure noise when the windows are open. It makes a loud noise throughout the car no matter if you have the rear or front windows open.